This unit is MOUNTAIN VIEW VIEW VIEW! Special* Book Now & We Pay Your Daily Resort Fee's! The Waipouli Beach Resort is a new concept in luxury accommodations on the lush island of Kauai, Hawaii and is centrally located within easy reach to any area of the island. Waipouli Beach 3rd Floor FULL MOUNTAIN View With the upscale features of a luxury hotel combined with the space and plush interior of this 2 bedroom, 3 bath, 1312 square foot unit that includes an ultra gourmet top of the line kitchen with a Sub-Zero refrigerator, Wolf glass cook top, Wolf oven, GE profile microwave, Fisher Paykel dual dishwasher drawers, granite counter top and African Mahogany cabinets plus three full bathrooms with Peruvian Travertine tile surrounds,2 soaking tubs & 2 showers, and fine artwork. This unit is one of only 2 condos in Waipouli offering 55" 3D TV which includes 3D & Blu-Ray movies for you're enjoyment. September 2011 - This condo was 100% refurnished, including beds, towels, tables, furniture, pots, pans and utensils. Everything is 'brand new'. This unit has a new 55' High Definition (HD 1080p) Samsung 3D LED TV wall mounted + a Samsung 3D Blu-Ray DVD player along with several Blu-Ray & 3D movies for your enjoyment. The living room TV has a built in internet browser, access, browse & surf the internet, check Facebook, or watch your Netflix right on the living room Smart TV. Both Master suite's have wall mounted Samsung 40' flat screen LED TV's. This newly constructed luxury resort is located on the beautiful Waipouli Beach coastline between the historical towns of Kapaa and Wailua. If it is Paradise with an ocean view you're looking for, you will experience just that when you stay at this luxurious, serene, and truly inviting condominium. First class shopping is located just down the street at the Coconut Marketplace, as well as the new Costco in Lihue. The Princeville Resort, Golf Digests #1 Golf Course in Hawaii, is just 20 minutes to the North. For those who are looking for adventure, Kauai has all there is to offer. If an oceanic or water experience is what you are looking for, you may choose to explore the Napali scenic tour, Wailua River Cruise, Kauai kayaking, or a number of sunset dinner cruises. The island also offers endless snorkeling and scuba diving as well as exciting mountain river tubing through tunnels (flash light hats provided). For those that want to stay on land, Kauai offers ATV tours, horseback riding, hiking the lush rain forests or beautiful waterfalls, multiple zip line excursions, or any of the authentic luaus may be the island experience for you!! To top it all off, an aerial tour of the 'Garden Isle' via helicopter or airplane is a view to always remember & your only 10 minutes north of the Heliport in Lihue. Don't forget your camera as the Waimea Canyon Experience and the array of beautiful waterfalls will take your breath away. This Waipouli Beachfront Resort condominium is a perfect option for the Kauai traveler wanting luxury and pampering in a Kauai vacation rental. Now, add to all this to affordable pricing. This Beachfront Condo offers triple the space for one-third the price of a luxury Kauai hotel. 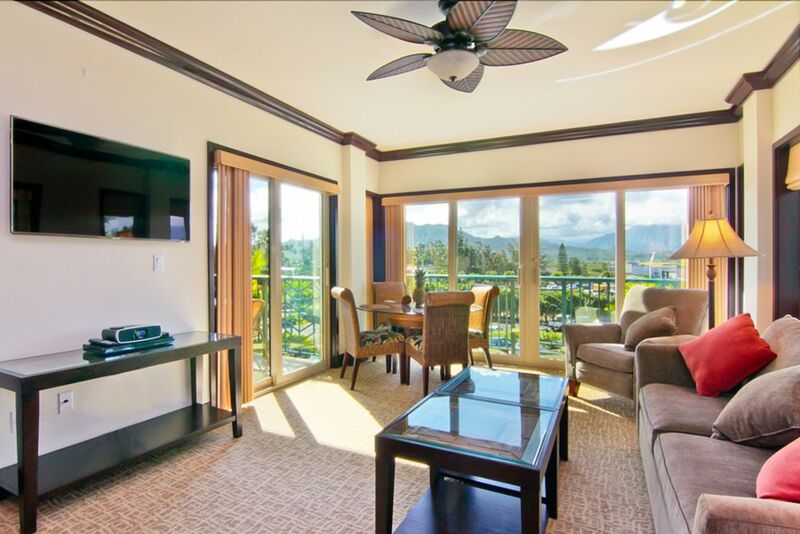 We purchased this condo as a second unit so every member of our family could come along on our yearly trips to Kauai. We purchased it empty in 2011 and therefor completely re-modeled the entire condo with the latest furnishings and most expensive and luxurious items we could find. We also put Cal King beds in each bedroom which is something other condos in Waipouli do not have to offer. From both master bathrooms you will get a nice mountain view. Both master bathrooms offers excellent views of the Sleeping Giant Mountains from the shower if you open up the wooden shutters above the bath tub. While your showering you are looking at the mountains & no one can see in because the windows are mirrored on the outside for privacy. Waipouli Beach Resort sits directly on, Waipouli Beach. The beach is soft sugar Kauai sand, while it's not the greatest for swimming, it's great for sunbathing and the water is always calm and warm. Waipouli Beach is a resort. Each condo is owned by someone like you or me. Included in the resort setting is one of the nicest heated pools on the island, a GYM & a beautiful beach. The resort is right on the beach "beach front". You will find lounge chairs on the beach for your use. Generally there won't be more than 10 people on the beach at any given time. Enjoy the beach! Direct Mountain Views From All 3 Rooms & Lani's. See Waterfalls Directly From This Condo When It's Raining On The Mountains. Waipouli Beach Resort is located directly on the Pacific Ocean and includes it's own golden sand beach. The A building is 75 feet from the high water mark & the D building is 200 feet from the beach. A Beautiful fitness room / gym is located just inside of the pool gates, included with the workout equipment is AC & TV's, towels and a water station. 55' Samsung Smart TV with WiFi Internet Browser, App's and 3D Capability in the living room. 40' Samsung TV's mounted on the wall in each bedroom. We have several Hawaiian Music CD's to choose from that can be played in the BlueRay Disk player over your TV speakers. We have a several BlueRay and 3D movies for you to choose from. Large Pool With A Lazy River, Several Waterfalls & 2 Water Slides + a Sandy Beach Entry. Pool is heated year round to 81 degrees minimum. I-Pod Players, LCD / Plasma Flat Screen TV's In Each Room (3 total). The south lani (balcony) has a dining table that seats 4-6 people should you choose to dine outdoors and enjoy the trade winds with a view of the Sleeping Giant Mountains. D-303 at Waipouli Beach Resort was a perfect spot for our group of 4 adults and 2 babies under one. We came for a wedding but decided to make a family vacation out of it and we are so happy that we did! The island is absolutely beautiful and we were so privileged to be able to see so much of it but also have a comfortable place to kick up our feet during nap times and when the kids turned in for the night. The condo had everything that we needed and then some and the pool was a perfect place to relax during a few of our slower days when we didn't want to pack up the kids and drive. The location was perfect for our first stay on Kauai as the north and south were easily accessible via a fairly quick drive. There is some traffic congestion just south of the condo but it was pretty hit or miss whether we got stuck in it. Overall, not a dealbreaker for us. We walked to the coconut market a few times to pick up fresh fruit and also enjoyed our walk into Kapaa where we had the most amazing tacos (Al Pastor) and shave ice (Wailua shave ice). We were also lucky enough to see a Monk Seal sunbathing on the beach a few times right in front of the hotel which I think was my son's absolute highlight of the trip. Another review mentioned the sound of traffic from the unit but we didn't notice it at all and with 2 small babies we probably spent more time in the condo than the average visitor to Kauai! Overall we very much enjoyed our stay on the island and wouldnt hesitate to book again at Greg's condo. This was the first time I truly was not ready to leave at the end of my vacation! The main issue we had was the VRBO pictures showed the mountains as you look out the sliding glass door, however, it did not show that you had to look over Safeway, ABC Stores, Ross, Panda Express, Starbucks and lots of smaller retail stores. They were not present in the pictures on VRBO. The weather was not cooperative, but that had nothing to do with the condo. However we did have all the doors open and unbeknownst to us, the only road that goes around the island, was in our backyard. We heard street car racing all night long, as well as trucks and cars. It took away from the ambiance of the "Island of Paradise". It also surprised me by the amount of tourists on the island. I had heard it wasn't so commercial, but that is not true. I generally stay in Kihei and I thought Kauai was busier than Kihei. None of the waterfalls were open either. Sign was posted that it was too dangerous to hike due to the rainfall this year. All in all, I don't think I would ever go back to Kauai, however, the condo was fine, just not the location. Very nice, comfortable and roomy condo. And as questions came up since the range/oven was smarter than us; we could text Greg and he told us what to do. Also liked the location by grocery store, Ross if you needed more clothing ;) and restaurants. Since we couldn't go into the ocean due to high surfs, etc. the pool, hot tub and restaurant was great! Easy to get around Kauai and back to airport. Thanks for offering your place to us. We loved staying here and will definitely be back! The place was wonderful and kept very clean. It also had everything we needed in the kitchen and for the beach! Other Activities: Kayaking, wildlife viewing, rock climbing, shopping, boating, relaxing on your own beach, Na Pali Coast, Poi Pu Beach, Kipu Kai Tours, Hanalei Bay, Princeville, Queens Bath, Secrets Beach, Blow Spouts, Helicopter Tours, Snorkeling Tours, Deep Sea Fishing, lots of Hawaiian Monk Seals & Giant Sea Turtles to be easily found on beaches around the island, and a great 7 mile long bicycle path along the beach which starts 1 block north of Waipouli Beach Resort. *BOOK THIS CONDO AND I WILL PAY YOUR DAILY RESORT FEE'S. *WE GREATLY APPRECIATE WHEN YOU ARE ABLE TO BOOK YOUR CHECK IN OR CHECK OUT DATES ON THE SAME DAY THAT OTHER GUESTS ARE CHECKING IN OR OUT WHEN MAKING RESERVATIONS DURING MONTHS THAT ALREADY HAVE BOOKINGS LISTED ON OUR AVAILABILITY CALENDAR. THIS HELPS US KEEP THE RATES DOWN BY ELIMINATING NIGHTS THAT MIGHT OTHERWISE GO UN-RENTED.